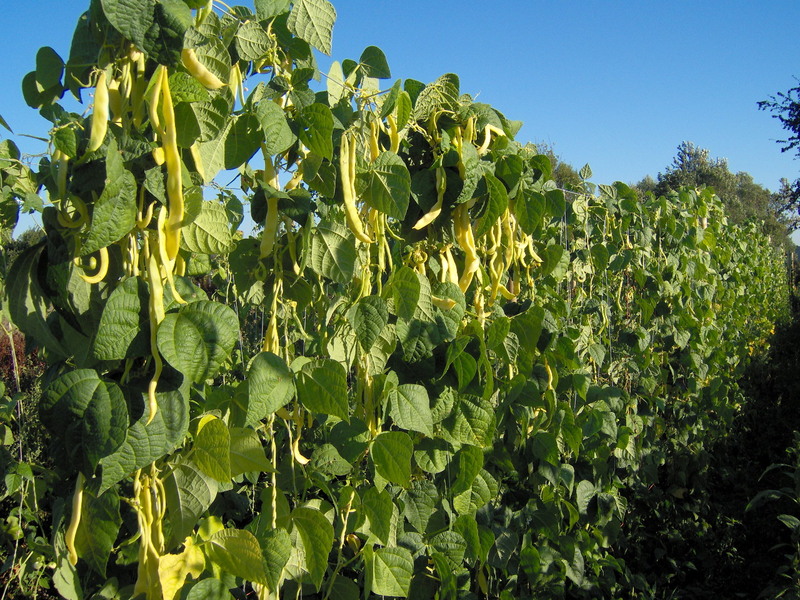 Vines festooned with golden, heirloom “Meraviglia di Venezia” romano beans. Our mission is to provide you with the freshest, most flavorful, chemical-free produce possible. Every week we assemble a tasty, well-balanced assortment of the various items that we are harvesting that week. Subscribers share in the risks and abundance inherent to farming. Certain crops may be delayed or fail, due to weather or wildlife, while others excel. A complete harvest failure is very unlikely. However, individual crops do regularly fail—cool summers bring lots of broccoli and few tomatoes, for example, emphasizing the importance of crop diversity. Early in the season, allotments will be on the light side, containing largely greens and salad goodies. Into the summer, you will find more variety, and shares should include among others, basil, broccoli, beets, carrots, beans, potatoes, tomatoes, peppers, and squash, as well as greens and lettuces. Just for fun, our subscribers can expect a number of exotic crops, like Artichokes, Cipollini Onions, and Japanese Eggplant. However, the bulk of the weekly boxes will consist of more traditional staple vegetables like Broccoli, Lettuce and Cooking Greens, and sweet Carrots. See our Crop Schedule for a better idea of what crops to expect throughout the season. See the chart below for sample harvests for an idea of how much produce to expect each week. We harvest most of our produce less than 24 hours before you get it—some items like sweet corn, herbs, and delicate greens are harvested that very morning and throughout the pickup day. Subscribers can expect a great deal of variety from week to week, as we try to ensure that no-one gets tired of eating the same thing every week. (Visit our blog archive for last year’s weekly share contents and news. )We no longer print a weekly newsletter. Instead, we publish a blog. The weekly posts include a list of what produce is included in the share for that week, news and photos from the farm, and recipes to help you in cooking anything that might be new or unusual. Occasionally there are extra posts to read as well. We offer three share sizes. Small Shares feed 1-3 adults, while Large Shares generally feed 3-5 (depending on what percentage of your diet consists of vegetables), but see below for a better idea of how much produce to expect. Both share sizes will supply fresh produce for 20 weeks, from mid-June through late October. Mini Shares give subscribers their choice of 5 items per week and is meant to be a gateway to the CSA concept or to supplement a home garden’s production. Subscribers also have the option of reserving eggs and poultry prior to their availability to other folks. Reserve yours with your share registration if you like. By signing on with our farm for the season, you play a direct role in sustaining local agriculture, ensuring a healthier, tastier future for all of us—your family and our community. We encourage you to pick up your produce at our roadside stand at the farm—members who choose to pick up at the farm enjoy a savings of $55 per season. We offer farm pick-up on Saturdays or Tuesdays. On pick-up days at the farm, we set all of the produce out on tables in our farm stand. We post a list suggesting quantities of each item, and then everyone helps themselves. Choose a large head of lettuce or a smaller one, or substitute an extra bunch of basil for carrots—you get to choose. We package all produce for Seattle subscribers, however, because we haven’t yet been able to figure out how to bring the farm stand to our neighborhood drop-sites in Capital Hill, North Seattle, the University District, and Magnolia. We charge $55 per season to pack the boxes and delivery. In 2008 we began a new program. We now commit to provide 10% of our shares to hungry families in the Kent area, giving them a chance to enjoy our bountiful summer harvest as well. We are happy to accept contributions towards our donated share program. If you are, or know of a family that could benefit from receiving and using a share, please contact us or refer them to us. Study our Crop Schedule below to find out what you might be able to expect each week. If you’re interested in becoming a subscriber, or if you have any questions, you can request an application via email at shelley@whistlingtrainfarm.com.